Our curiosity about Nobu Ina has lasted for several decades. She might be the daughter of my maternal grandfather, William (Will) Liming Redles, and she might not be. My family has talked about her off and on for years. Who was she? It has only been within the past couple of years or so that I became serious about searching for Nobu Ina, but this might be a mystery that will never be solved. All of the people who know the truth are long gone. Some years after my grandmother Leona died, my mother and Aunt Catherine found their father's papers when they were cleaning out her storage. Included in his papers were many letters he had received. Most interestingly, there were letters from a woman named Nobu Ina that begin, "Dear Father," "My Dearest Father," "My Dear Father." We've wondered if referring to Will as "father" was just a term of endearment for a very good friend or if she was actually his daughter or step-daughter. There is nothing in her letters to indicate one or the other. A friend of my sister's asked her daughter-in-law who is from Japan about this. She said, in Japan, you wouldn't address a man in this manner unless he was your father. I still wonder, though. She signed her letters with "From N.," "Lovingly From Nobu," "Most Sincerely, From Nobu,"or "Yours N."
Written on the back: Ina Nobuko received Apr. 1920. Nobu's letters are sometimes quite poignant. In several of them, she expresses a wish to see Will. I don't think she ever saw him again; there is no mention of a meeting in any of her letters. By the time Nobu arrived in the U. S., Will was married to my grandmother. Nobu never mentions knowing anything about his wife or his children, at least not in any of the letters that I've seen. She indicates that he had written that he was ill. She tells him several times to take care of himself; she worries about his health. Some pages of her letters and some of the envelopes are (annoyingly) missing, and I can't help but think that they are in my dad's infamous paper piles in his office. My grandfather Will spent several years in Japan, but the only time period that I have found with specific mention of Japan is when he was appointed assistant attache at the American Embassy in Tokyo from 1915 to 1919. If he fathered a child during this time period, she would have been only 8 to 12 years old by 1923, the year Nobu came to the U. S., and much younger than Nobu seemed to be. He could have visited Japan earlier, as he served on the marine guard of the Asiatic Fleet from 1902 to 1906. 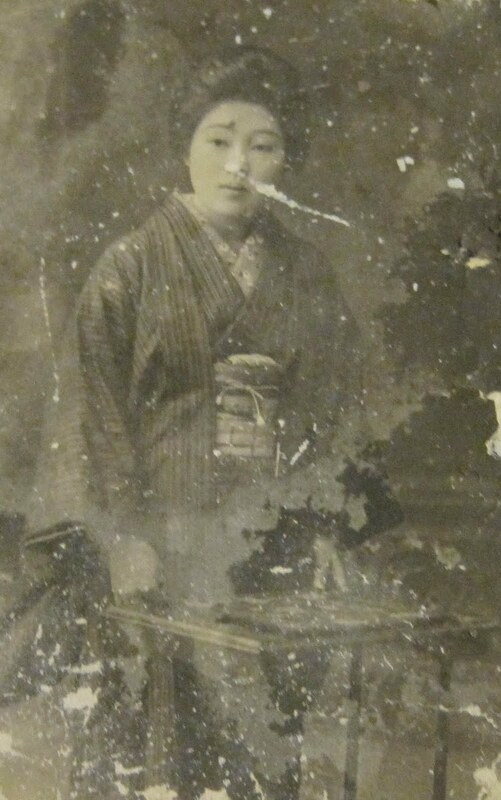 My mother has a photo of an Asian woman in Tokyo dated 1903 that she found in his papers (one photo among several). My mother and my aunt were told that Will had a Japanese wife and child. The wife died from tuberculosis. What happened to the child? Is the child Nobu? She mentions in one of her letters that she wore a white carnation on Mother's Day at the church she attended in Los Angeles because her mother was no longer living. My father and my Aunt Catherine tried to track down Nobu Ina over 40 years ago through the return addresses on her envelopes and by what her letters revealed. My mother and aunt wanted to know if they had another sister. In the late 1960s, my Aunt Frances (Thomas) McLaughlin, who lived in California, tried to find out for my father where the Los Angeles YWCA was located where Nobu worked to see if they had any information about her, but the YWCA had moved several times and was unable to help. My Aunt Catherine asked a colleague of hers to check the University of Chicago. Aunt Catherine told me that somehow she found out that Nobu had ended up in New York City and had a possible connection to the Methodist Church there. She wrote to Nobu but never heard anything back. My father was so intrigued with this mystery that he wrote at least two stories (that we've found so far). He calls her Miki Koto. In one of these stories, he has a letter dated 1930 from Miki Koto to her father asking him to not write the school in Chicago any more; that the dean might ask her to leave. I wonder if this is from an actual letter, as my father copied several of Nobu's letters for his story, but I haven't found the original, if there is one. As my father did with a lot of his stories, these have a lot of truth in them, but there are parts that I don't recognize, and I wonder which parts are fiction. Now, my father is gone, too, and my mother and my aunt have forgotten some of what was uncovered in their search so long ago. In The Search for Nobu Ina, Part 2, I'll write about what I've been able to find through my own research.